Read on as our nutrition expert offers six tips to give you a crop top-worthy flat stomach that looks as good as it feels. Some things in life just aren’t fair. You could be following a stellar workout regimen and a spot-on perfect nutrition plan, but still end up being at war with your body, feeling bloated, full, pushed, and gassy. The technical term: blah! This cruel experience has the ability to unravel all your efforts and give your self-confidence a blow. Fortunately, there are several smart strategies you can use to minimize these discomforting, sometimes embarrassing, symptoms so you can feel trim and light again. Cookie-cutter diet plans could be the main culprit because these plans are often not tailored to your current weight, activity level, your lifestyle, and preferences. Perhaps your carb cycling may be over-exaggerated, your proteins might be through the roof, or fat intake is well below your body demands, just to name a few. Use the common sense approach and if there is too much of a particular food in your daily nutrition and you feel lousy after the fact, replace it with something else. What works for someone else might not work for you. This is why I’m a huge advocate for dietary logging. Having that objective data at your fingertips allows you to pinpoint specific foods that could be affecting your GI system instead of making a guess and neglecting entire food groups. Fibrous foods (mostly veggies, fruits, nuts, and legumes) often cop the blame, yet fiber is extremely crucial to maintaining essential gut health and bowel regulation. If you’re eating too little or too much fiber, to a degree where it extends below or past the recommended daily allowance (RDA) amount of 25-35 grams, then you could suffer through an outbreak of symptoms. Beans, grains, and legumes are an excellent source of B vitamins, selenium, and potassium, but recent evidence also suggests they are fiber sources to be avoided if you want to alleviate bloat. Despite being whole foods, rather than to avoid them completely (unless an allergy exists), try eating them in smaller doses/portions. Once again, the more objective you are with your daily intake, the better you know what to manipulate if symptoms arise. Experiment for two weeks and note how you feel without the potential antagonistic food item. Did your symptoms improve, worsen, or not change? Slowly and one thing at a time rotate/substitute different foods and keep a diary of your experience. Carb cycling is an excellent tool to fight flab because it can positively influence one’s metabolism, but this can come at a cost. The yo-yoing between high- and moderate-carbs could be well beyond your body demands, which could leave you feeling sluggish, bloated, and lethargic. A common example is someone who has already been eating 200g of carbs and then suddenly doubles it to 400g the next day without slowly building it up. Your body isn’t accustomed to that regimen, so a more gradual approach would be recommended to alleviate that GI load. More carbs are metabolically and anabolically stimulating, but you can reach a point where simply feel the lethargy of insulin fluctuations. Sometimes fat may need to be a little higher, but that’s another discussion. Granted the idea of carb cycling is to stimulate your metabolism and can be useful for social events, eating such a large volume of carbs, especially if your workout routine doesn’t require you to, can cause more chaos and lead to that pot-belly feeling. If you can’t relate to any of the previous points, your problem might be your protein intake. Protein takes the longest to breakdown in the body, which increases metabolism and keeps one fuller longer. It is broken down into amino acids in the stomach, and if it doesn’t breakdown completely it will have a tendency to ferment and putrefy. Yummy! To ease this occurrence, try eating your proteins first in order for the stomach to digest them first rather than with any subsequent foods. Since protein takes time to digest and assimilate, just as complex/fibrous carbs do, both can further aggravate GI distress since absorption is slowed down even further. Ultimately the food item causes creates more fermentation in the stomach, leading to increased symptoms of bloating, flatulence, or indigestion. Another simple tip is to rotate your protein powders because you might be intolerant to a particular type. If you’ve been neglecting your core then this could be a factor. Research in the New Zealand Medical Journal found that individuals who have gained weight and have weak abdominal muscles tend to suffer more from visible bloating than those with stronger cores. The likely hypothesis to explain this is a stronger core acts like a corset holding the bloating inside, which forces excess gas to follow its natural path. Stick to training that core of yours a couple times a week! That mid-afternoon candy bar might seem innocuous, but it could be playing a huge role in your bloating. Research in Clinical Nutrition found that 72% of people who suffer from abdominal bloating, and too much gas, had a problem digesting certain sugars. The common offending agents were lactose, fructose, and sorbitol. In the same way you can mindfully include or limit refined/processed carbs, it is important to see how you feel after a pre-workout dose of sugar to make sure it’s not a major cause of any GI discomfort. Finding it difficult to regain that momentum you had prior to the holiday? Our wellness columnist explains the seven simple tips you need to get back on track. Who isn’t busy these days? We’re in a perpetual state of running to appointments, dealing with life stressors, work demands, family obligations and doing things for others. Many of us are so busy that we neglect to check on ourselves first and maintain our health. I get it; we’re all juggling with something that shifts our focus away from where we need it most. However, maintaining everything can get tricky and time can slip away. I believe all of us are goal-oriented individuals. If we don’t have incentive and give attention toward reaching our goals, what started out as great intentions for the start of summer have now become afterthoughts. Time management skills is one of the best tools for setting yourself up for success. Here I share my top tips to remain focused or regain focus of your health and fitness goals. While this obvious and rather common knowledge, how many of you have actually created one with measurable parameters? It can be easy to lose track of time and direction if you don’t have an end goal in mind. This is why it’s important to be very clear on what exactly your goals are. Whether you want to lose weight, increase lean muscle mass, improve your eating habits, manage your stress or change careers, determining what your goals are is an important first step towards managing your time and being successful. I recommend writing your goals down and placing them somewhere where you can see them every day. This will serve as a reminder when life gets hectic—it’s inevitable—and will help you stick to your goals when it may seem easier to skip them. Once you have determined your goals, give it a timeline. I advise starting from the finish point and work backwards. For example, let’s say your goal is to run a particular distance, figure out how much time you will need to prepare first. The same concept can be applied for other goals such as weight-loss, gaining mass or even getting more sleep. Start at the end and figure out how much time you will need to reach your goal. I realize this seems to elaborate further on tip 1, but bear with me. Intention doesn’t mean action. Anyone can have the greatest intentions or plan, but without action steps nothing will occur. Once you know where you are going and how much time you will need, it is now time to write down exactly what you will need to do. If the goal is to lose weight, for example, you will likely engage in exercise, be more mindful of your eating habits, drink more water, get adequate sleep and be consistent with each. Now break down the main, long-term goal into small, manageable, short-term goals. Ask yourself: What will you do for exercise? How many days a week? How long each day? How many days will be devoted to resistance, cardio and flexibility? Be very specific with the actions, and write them down. As for improving your eating habits, it requires you to be attentive to thoughts and choices. Perhaps that means making a grocery shopping list and planning your meals ahead of time. Based on your day-to-day structure and context, does that mean planning ahead for the week or only a couple of days? Sometimes planning that far ahead may even be a stretch, so what is the course of action you will take to remain in control and mindful? That’s where maintaining a daily logger is helpful in order to provide objective data of where you stand. Say you are dining out, what is your plan? How will you handle this situation without throwing your hands in the air? Prepare ahead of time, set up some strategies; again write down the steps to help you achieve the outcome you desire. The clearer, more detailed you get, the better you will be in managing your time and reaching your goals. This is rather simple, relatively speaking. In order to stay faithful to your workouts, trips to the grocery store, or other healthy “to-dos” in your calendar, write it down. Just as you would for work meetings or medical appointments, make it a point to block time for the activity on your calendar. You’re more likely to stay on track when it’s scheduled. This was briefly shared in tip 2, but now that you have gone to the store, make an effort to prepare your meals. Fail to plan, prepare to fail. We hear it all the time, but do we actually do it? Daily preparation can be exhausting and impractical for many, so choose a day during the week best for you and prepare a few days’ worth of meals. Using a nutrition journal as a tool will allow you to stay on track and still meet your daily nutrition numbers. It’s just a matter of choosing your favorite meals and making them fit within context. If you don’t spend a lot of time cooking at home, but rather dine out frequently, devote some time reviewing restaurant menus beforehand to determine what fit best for you based on daily goals and context of the meal. When the kids are down for a nap or you have an extra few minutes, take advantage of this time. What tasks have you been putting off for yourself? What do YOU need at this moment? Ask yourself that. Use this time to focus on yourself. If you are at work, take a walk. If the kids are asleep, get in a home workout. If you have 10 minutes to spare, relax and do something you love. Don’t neglect yourself in the process, enjoy it! While it’s easy to feel overwhelmed and like you just “don’t have the time,” the reality is we can create the time if we make our goals a priority. Once a day, take the time to evaluate your progress, your time and the plans for the upcoming day and week. Does something need to be better allocated in your day or sacrificed? Do things need to shift a bit? What are potential barriers today? What could I improve? What could I let go of? This step is critical, as it will help keep you balanced and present in the moment. Self-regulation is what separates those who achieve their goal and continue to flourish. The ability to focus, resist temptation and redirect our attention speaks of self-regulation. It’s the process towards self-awareness. We have the ability to think about our thoughts, be aware of our awareness, behave according to our behavior and have feelings about our feelings. With this level of perception, we can be the masters of our destinies. A question for you: Can you think of a time in the past where you set an unrealistic goal and struggled to hit it? How could you have modified the goal to make yourself more likely to succeed? Be specific. Experts say a high-protein diet is the key to losing weight, but what are the differences in protein sources, and why does it matter? Our healthy living columnist explains. What is the best when it comes to protein powders? As a nutrition supplement, protein offers one of the biggest bangs for your buck and is most convenient. Protein powders are everywhere; it’s plentiful at every grocery store. You can even find them at gas stations. Plus, food companies are becoming “smarter” by marketing more protein in their products. Thirty-five grams of protein per serving compared to 20? Whoa – that must mean more muscle or faster weight loss! Isn’t that how it goes? More protein means better quality and better results? Not even close. I feel protein is seen as that miracle supplement that will shed weight and keep you full. Plenty of research does support it can promote both, but it’s not absolute. It’s much more than that. Therefore, what’s the best and healthiest option? There are different protein powders for a reason, and it’s largely based on one’s goals and preferences, not just for taste and the highest amount you can consume at once. So before you make the investment in another giant tub of powder, you ought to first understand some basic protein principles. Most realize protein helps with muscle synthesis and growth, but there’s more to it. Like carbohydrates and fat, protein is a critical macronutrient your body needs daily. Protein can also help with repairing damaged cells and tissue throughout the body, synthesizing hormones, and is supportive in metabolic activities. Despite these important reasons to include protein in your diet, a main reason why protein is in the media is because it provides satiety to aid in weight loss. Since protein helps you stay full, it makes it easier to stay within an ideal caloric range. Just as carbohydrates come in different forms (simple and complex carbs; fibrous and starchy carbs), there are different protein sources that have different effects on metabolism and exercise performance. Having an understanding of eating the right kind of protein at the right point in your routine, you can maximize its benefits and your goals. I’ll focus on three of the most common protein sources found in stores today: whey, casein, and pea. Do keep in mind the principles are the same for sources, such as soy, dairy, beef, hemp, and rice. This is among the most widely consumed protein supplements. It comes from the translucent, liquid part of milk that’s left over from cheese-making and is a complete protein, meaning it contains all nine of the amino acids humans need. Whey is a fast-digesting protein because once consumed, your stomach assimilates it quickly. This leads to an increased rise in the amino acids circulating in your blood, making it a good choice for a post-workout snack. About 1-2 hours after you exercise, your body experiences a spike in protein synthesis, during which it works harder to repair the muscles you worked. If you consume whey within 60 minutes of your workout, your body can quickly absorb the amino acids to take advantage of this anabolic window and supply your body with what it needs. Unless you plan to sip whey throughout the day and evening, its quick-absorption make it less than ideal for a mid-day snack or meal replacement. That’s where most protein powders are a fusion of whey and whey protein isolate, or casein, to slow down the absorption; therefore, you feel fuller longer and maintain a steadier, positive nitrogen balance for your muscles (to encourage growth). The cousin of whey; casein is the main protein component in cow’s milk. It, too, is a complete protein. Unlike whey, which is quickly digested, casein forms a gel once it reaches the stomach. As you could predict, this chemical reaction makes it relatively insoluble, so it takes the body longer to break down. This is a similar reaction when eating insoluble fiber. Casein is a slow-digesting protein, therefore. It provides a steady release of amino acids over several hours. Having said that, casein can still be another good option as a post-workout snack. Studies have found a synergistic effect to be created when whey and casein are combined. Classically, taking whey within 60 minutes of your work out and then taking casein right before bed is the ideal combination. Because of its steady release, casein helps create an “anti-catabolic” environment in your body when you body synthesizes protein. The nature of casein provides a steady supply of amino acids to make the most of that window and promote muscle growth/recovery. Caution, caution, caution: both pure whey and casein come from cow’s milk, so neither is well suited for individuals with dairy allergies. The more isolated the whey protein is, the better it’s tolerated. For the unlucky ones who cannot tolerate dairy, here comes their salvation. Pea protein has been appearing on store shelves more frequently, and it’s an excellent alternative to traditional protein sources if allergies exist or if an individual prefers plant-based nutrition. Pea protein holds middle ground as it is digested at a medium rate, providing satiety levels that are about the same as whey and casein. Therefore, it can be used as either a post-workout supplement or meal replacement. One downside to pea protein is that it isn’t a complete protein and shouldn’t be used as your main source of dietary protein. It is a supplement after all. Even with all the existing protein supplements on the market – and there are many – research continues to flourish with new sources and combinations. You can even buy beef-based or egg white-based protein powders. Therefore, explore what’s out there. Be curious about learning and what can maximize your health and fitness goals. Unlike a lot of over-hyped, unsafe supplements, protein really does help within context. Since you’re going to be eating it anyways to stay alive, you might as well make smart protein choices that help meet your goals. Increased fiber must mean it’s healthy and best for you, right? Our health guru shares some bathroom reading regarding four common fiber myths. I type this article with trepidation because no one likes to hear the words flatulence, diarrhea, and bloating. While these words are commonly used in my professional life, it’s not exactly table conversation. When seeing patients though, it’s inevitable to discuss bowel habits and the importance of fiber. The more I think about it, everyone does seem to talk about poop and fiber. I didn’t anticipate my career to take this turn. Nevertheless, fiber seems to be misunderstood. Modern food manufacturing processes – especially in the low-carb industry – have brought a high level of dysfunction into lives needlessly. Therefore, I think it’s important to discuss some common fiber myths. Fiber is necessary for bowel function. Too little of it and it can lead to constipation or bouts of diarrhea – two sides of the same coin. When one’s intake consists of low-fiber foods, it’s often associated with increased cases of inflammatory bowel disease and cancer. There’s even known links to heart disease because a low-fiber diet usually indicates someone is eating an excessive amount of sugar and fat. 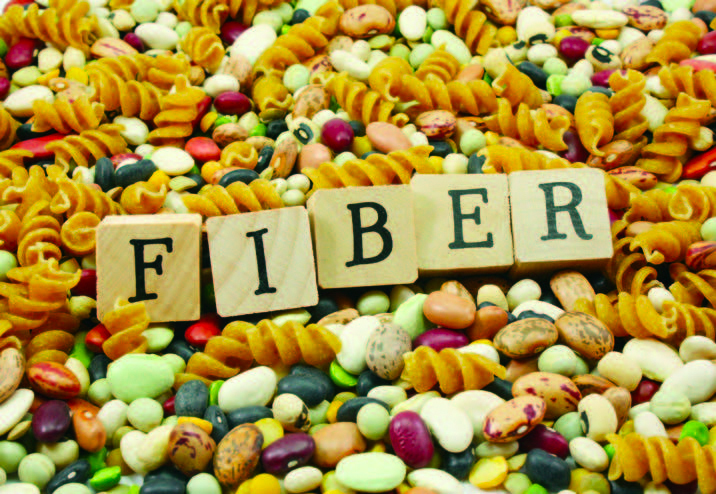 To illustrate the benefits of fiber, see it as a broom for your gastrointestinal (GI) system. It increases bulk, softens stool, and shortens transit time through the body. Too much fiber though can create impaction, leading to a serious medical issue. Conversely, too much fiber can make diarrhea probable when a binding agent, such as starch can’t do their job. Too much chronic abuse of fiber can ultimately lead to inflammatory bowel diseases, such as ulcerative colitis and colitis. I suggest eating a good serving of vegetables in a couple meals and a serving or two of fruit per day. Generally speaking, 25-35 grams a day of fiber is sufficient unless a known GI issue or food intolerance exists. Fiber supplements may be needed, but self-experimentation and journaling are important to connect any symptoms to the foods you’re eating. While I don’t condone the intake of a macrobiotic-rich diet, it seems everyone who endures GI distress thinks, or is told, to eat more and more vegetables. Nothing could be worse frankly. Because of the raw roughage and complex, hard-to-digest grains, it will create more GI inflammation, thus worsening one’s symptoms. Try limiting raw vegetables, and you might need to decrease the size and frequency. Eat small amounts of steamed vegetables instead. Starch is a friend to someone who has inflammatory bowel issues, but fiber is still necessary. It just means the balance may need to be tilted towards the more soluble type of fiber. Here’s the reason why fiber is so popular and mainstream – to aid in weight loss. Let’s establish one thing, your body needs starch (carbs), even when dieting. Cutting out carbs completely will reduce your metabolism faster and increase muscle catabolism (breakdown) more than other dieting method. However, those who get caught in this trap miss the opportunity to include more satisfying, more anabolic (muscle building), and more metabolic complex starch sources. Don’t get caught up and deceived by misinformation. Include those whole-grain pastas, breads, rice, quinoa, potatoes, oats, and many more. Dare I even say have a Reese’s cup or white rice as long it fits the context of your goals and macronutrient requirements. Lets say it together: too much fiber is too much fiber. While most avoid fruit because of the carbs, the fiber found in most fruit is extremely helpful with stool formation. However, the need for increased fat in one’s diet can also help with regularity. Flaxseed oil is a favorite for its omega-3 fatty acid qualities, and a small serving or two per day can be the ticket to stimulate GI movement. When polysaccharides can’t be digested in the upper GI tract, the bacteria of the lower GI tract consume and ferment them, and the byproduct is methane gas. Not only is it annoying, it’s inflammatory. How often do you hear others blame their protein shake, or assume it’s normal? No one realizes the things we can’t digest are causing the inflammatory process. You do have options though. Consider cheap protein, soy, legumes, harsh vegetable fiber, nasty filler fiber in low-carb products, and lactose as primary offenders and cut them out. Take every processed food out of your diet and start adding one thing in at a time and you will find there are some items you can consume in small amounts, but there is a limited amount of digestibility. Some foods are better completely avoided. Not too often does a person have upper GI issues to the point he or she feels bloated with a normal-sized meal. When you eat a meal, everything is pushed along all 20 feet of your intestinal tract. Food in, food out. Because food is shifted further after eating, the methane gas production and discomfort felt is happening at the other end, not in your stomach. It normally takes 18 to 24 hours, or longer, for a complete digestion cycle. When you feel bloated after a meal, it’s the meal you consumed 18 to 24 hours earlier. Track that meal accordingly and identify any possible offenders. The exception to this is when a strong allergic reaction is caused or an irritant is consumed, but I assure you you won’t be worried about the gas and bloating because you’ll be sprinting to the nearest bathroom. All kidding aside, bowel health is serious and suffering doesn’t have to be part of good health or weight loss. There are no quick fixes, and never settle for cliché, cookie-cutter diet plans that leave you hunched over. For decades, our society has focused on the importance of being skinny while frowning upon “thicker” body types. The media perpetuates the lie of “the skinnier we are the more happy and successful we will be.” This thinking has caused men and women to go to extreme measures at the cost of their health. 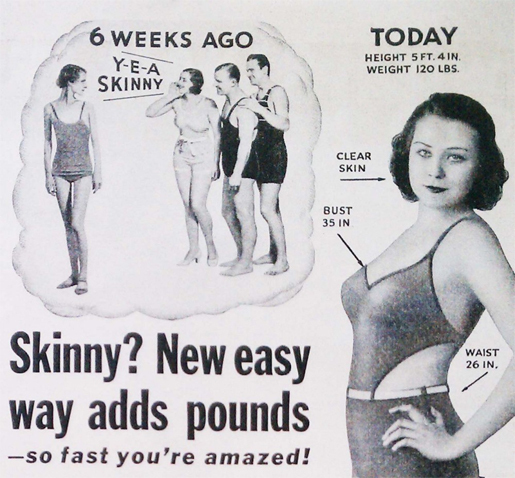 The above-pictured advertisement from the 30s seems so funny now, but having a little extra body fat was associated with health and vitality. The media’s convincing lies of “you will be happy if you are skinny” has challenged my objective when working with a new client. One of the first things I have them do is to watch a movie called “Hungry for Change.” (part 1) I encourage you to do the same. When I competed, years ago, I followed the traditional “body-building diet” and achieved my dream body. I may have looked good on the outside but I was dying on the inside having developed chronic asthma, chronic fatigue and other health issues. Switching my focus to getting fit and healthy was a game changer for me. I am proud to say I am cured of these conditions through a fit and healthy lifestyle. Remember, it’s not a diet, it’s your life. A diet is a temporary “quick fix” in achieving a goal to be skinny. When you begin to chase the idea of getting as healthy as possible by eating whole unprocessed foods, learning to detox your body on a regular basis and incorporating exercise, the result will be a REAL and LASTING CHANGE. Recovery after exercise is essential to muscle and tissue repair. A muscle needs anywhere from 24 to 48 hours to repair and rebuild. Working a muscle again too soon simply leads to tissue breakdown instead of building. Not getting enough ZZZZ can be one of the most detrimental things you can do to your health. It leads to weight gain, diabetes, heart disease and much more according Dr. Mark Hyman who explains this in the video below. On the other hand, it can also be our greatest asset to restoring and healing our health. Planning rest days and even planning how you’re going to rebuild what you broke down is as important as the workout itself. Sounds counter intuitive I know, but what gets broke down must be built back up. Even though exercise is good, you create a lot of free radical damage and the way you correct this is through clean eating and super foods. I ran into this issue this week myself, I didn’t give myself enough time to recover and my body became exhausted, forcing me to take a break and slow down. I broke a cardinal rule of training, not listening for the signs of over training and getting the proper rest needed for recovery. To replenish myself after a workout I will have a protein shake that contains super foods like Chia seeds, Hemp seeds, Hemp seed powder, Cacao powder, whole flax seeds along with some sort of berries and coconut milk. 1. Get plenty of sleep (at least 8 hours) and don’t feel bad for having a 20 minute nap in the middle of the day. Learn to LOVE sleep. 2. Make sure you are eating nutrient dense foods and super foods. 3. You need 1.0-1.5 grams of protein per lean mass when you are training heavy to build that muscle back up. 4. Skip the junk food, it doesn’t add anything to your health, but takes away. 5. Hydrate, drink plenty of good clean water! Watch this informative webcast below! Protein consumption for endurance athletes are 1.2 to 1.4 g per kilogram of body weight per day, whereas those for resistance and strength-trained athletes may be as high as 1.6 to 1.7 g per kilogram of body weight per day. Do you see a setback as a failure or as an opportunity? How you answer this question will determine your ability to move mountains or stay stuck in the past. I tell my clients all the time there shouldn’t be any good or bad, right or wrong, guilt or shame if they get the result they are looking for. I tell them not to take the setback personal; it has nothing to do with who THEY ARE. Life happens, we adjust the best we can and sometimes we may feel like doing the work required to reach a certain goal. It IS what it IS, so evaluate the plan, see where there may have been a weakness or obstacles you didn’t foresee, make the changes necessary then get back on the wagon. I had an opportunity to experience this myself. I made a goal of going to the Arnold Classic 2013 in Columbus, Ohio wearing the jeans (totally inappropriate for my age now, haha) that I wore 13 years ago when I was competing. I thought the jeans would be a good milestone for me. Well, needless to say I didn’t make my goal. In fact, I no longer could fit in the jeans. Keep in mind I could fit in my jeans when I started my goal. So the moral of the story is, I went to the Arnold anyway in a larger pair of jeans, but I had a choice to make this situation as a setback and take it personally or use it as an opportunity to grow. I repeated over and over in my mind….there is not right or wrong, good or bad, guilt or shame just RESULTS. I wanted to admit defeat allowing myself to think the worst. However, I took hold of these thoughts and did not allow them to take over my mind. I instead held on to my good attitude and had a wonderful time. I took a hard look at why I did not get the result I was looking for and lo and behold I found them. I hadn’t been focusing on my goal and doing my Daily Daydreaming Practice. My goal wasn’t in forefront of my mind. I also didn’t add the structure in place I needed to make it happen. What a powerful learning experience it was for me to go through in my own personal journey. I have set a new goal and created a plan of action with milestones for accountability. I am giving myself plenty of time to account for unforeseen obstacles and I’m doing my Five Minutes a Day Daydreaming Practice to bring my goal into existence. Will I stumble and fall at times? Sure, but it’s all a part of the process in which I allowed time for. I have found that it’s in our weakness and failures that we learn and grow the most. I feel blessed to have been reminded of this valuable lesson. Don’t take failure as a personal failure, just learn, grow from it, and carry on living an extraordinary life! A new study from Glamor Magazine discusses how cruel our internal dialogue is. I think you would agree if someone told you, “You are fat and disgusting”, you would be horrified and probably would not tolerate someone degrading you in that way, but some of us tell ourselves the same thing on a daily basis. How can our bodies give us anything else, but what we ask of it? I teach my clients to always watch their self-talk, especially when they’re embarking on a lifestyle change challenging enough itself. “Neuroscience has shown whatever you focus on shapes your brain. If you’re constantly thinking negative thoughts about your body, that neural pathway becomes stronger—and those thoughts become habitual,” says Ann Kearney-Cooke, Ph.D., a Cincinnati psychologist who specializes in body image and helped Glamour design the survey. Can you change this? A big fat YES! It does take time and practice, but over time you can and will take control. One of the things I do is when I have an automatic negative thought; I replace it with something good so I can counteract the negative thought. It really does work overtime. Does this take away from the fact that my body may not be perfect? No, but loving and respecting my body as a vehicle for my spirit is a much more empowering way to walk through life. I challenge you today to write down the things you say to yourself for a week. After the week is up review yourself talk, if it needs to be improved take on this practice. Something to keep in mind as you do this is when your words actually do leave your mouth and children are present. You are teaching them how to talk to themselves. Be kind to yourself and YOUR body will respond in like manner. For more information visit Jackie Walton’s Facebook Page. While the weather here in Cincinnati can’t seem to make up its mind if it’s winter or spring, the season of the dreaded bathing suits is right around the corner. Many of you might already be in training for the kick off of swim suit weather on Spring Break. Whether you’re taking a trip to the beach or just dreaming of a tropical vacation, now is the time to start working on that beach body of yours. Hey, you never know when you could get whisked away to a tropical island. It doesn’t hurt to be prepared or dream does it? In order to get that beach babe body we all know you have hiding, make sure to focus on three important keys to bathing suit body success: Switch it up, Watch your diet, and don’t shy away from strength exercises. Switch it up! : Too often people get comfortable with their workout plan and then low and behold the inevitable plateau rears it’s ugly head. Throw that plateau a curve ball and bring in a switch hitter. Try adding new classes, new types of workouts, or change up the order of your routine. The body is pretty smart, but you are smarter and can trick it back to revving up that metabolism. Watch your diet: Beat the bloat. Cut out salts and sugars leading up to the beach to show off those abs you have been working so hard on. You may be doing crunches every day, but if you don’t cut back on the sodium and sugar they will stay hidden behind the bloat. So lay off the sweet and salty foods so all that hard work can show through. Then your abs will get a lot of attention as you treat yourself to an umbrella drink on the beach. Tighten and tone: strength exercises are essential to getting those lean and toned muscles we all dream of. Cardio alone will not get you to your goal so don’t be afraid of adding a little strength training to your routine. We often shy away from the weights in fear of bulking up. But have no fear ladies, you will not look like Arnold Schwarzenegger from doing lots of low reps with light weights, but warning you might just end up with Michelle Obama arms. Keep these three tips in mind as you gear up for the days of sunshine and swimsuits and you’ll be on your way to rocking that beach body of 2012. Sounds like a good reason to go ahead an buy that bikini to me! Bella Forza Fitness: Got the Blues? I don’t know about the rest of you, but the past month has been a little difficult to stay motivated and on track. The cold mornings make it difficult to climb out of a warm bed in order to hit the gym before the start of your day. Although the allure of a comfy blanket and warm cup of coffee on the couch is tempting, don’t let the winter lull get the best of you. Not only is exercise beneficial for your weight loss goals, it is also mentally beneficial. Exercise releases endorphins, which are neurotransmitters. These neurotransmitters act like a pain killer for your body. It’s like your body’s own happy pill. Seasonal Affective Disorder (SAD) is the real deal, and as these dark days continue, our moods can decline without enough Vitamin-D from the sun. Combat SAD with some exercise to get those endorphins going. Try to add in some outdoor workouts to soak up whatever rays are peeking through those clouds. Maybe you’ve heard that “stressed” is “desserts” spelled backwards. Although this might be the way some of us prefer to cope with extra pressure and stress, it’s not the wisest and will most likely only add more stress as we struggle to wiggle into those skinny jeans. Cortisol is released in the body when we become stressed, which can naturally cause weight gain around our middles. Don’t add to this with desserts, but instead battle it with a great workout. Not only will you fight the negative effects of cortisol, but you’ll also get your heart pumping and your head clear. The cold and flu always seem to be looming in the winter months. Don’t let yourself get sidetracked with illness; instead, keep the sniffles at bay with exercise. Exercise not only helps keep your muscles strong, but it also boosts your immune system. If you are still in need of a little extra motivation, plan a trip soon that requires a bathing suit or sign up for an upcoming 5K. Having a goal in the near future will help get you out of bed on those chilly mornings. So, lace up those sneakers, and fight off those winter blues.